Brian Hyman shares the powerful story of the moment he learned that those we love never leave us. “I will not let you fall” is what I said to my mother before we danced at my sister’s wedding on a warm Florida evening. My mother had late-stage brain cancer at the time. Her doctors figured she had a few months to live. She was unable to walk or speak properly. We made quite a pair: a 56-year-old woman with a fatal diagnosis, death looming, unable to dance; and her son, 34, an active addict, visiting from Los Angeles, drunk from too many vodka martinis at the open bar. Perhaps it was the free, top-shelf booze that encouraged me to do something impossible that night; perhaps the decision to walk over to my mother and ask her to dance was an intuitive thought from God. Regardless, against doctors’ orders, laws of gravity, and common sense, we danced. I walked over to my mother and asked politely if she would do me the honor. She gave me a funny look as if I were crazy. I told her, “I will not let you fall.” She looked at me with a sad, yet hopeful stare. I reached out my arms and repeated myself: “I will not let you fall.” There was a conviction in my voice now. I smiled and said again, “I will not let you fall.” My mother gripped my arms and ambled to her feet. I wrapped my body around hers, dug my heels into the floorboards, bent my knees, and jerked her up. As best as we could, we advanced toward the dance floor. Guests parted as we approached. Onlookers paused and stopped dancing. My mother had not been on her feet in quite some time. This was an unexpected surprise. “Collide” by Howie Day played on the sound system. And my mother and I danced at my sister’s wedding. Tears of joy and sadness flooded the room. If I had not orchestrated this moment, I likely would have cried, too, yet the last thing I wanted during those last months of my mother’s battle with cancer was for her to feel inferior or pitied. So I held back tears as best as I could and we danced. My father soon walked toward us. His eyes were wet. He asked to cut in. I obliged. He smiled at his wife of 35 years. He threw his arms around her waist; they danced their last dance together. 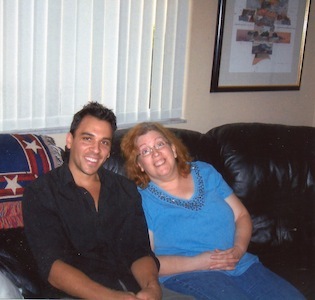 Not long after the wedding, I moved from Los Angeles to Florida to help care for my mother. I had not yet found recovery; however, I managed to remain sober for six weeks while being of service to my family. During this time, the live-in hospice nurse yelled from the bathroom. My mother was about to fall in the shower. I ran into the bathroom. My mother was propped up against the shower wall. The nurse stepped aside; I wrapped my arms around my mother. I grounded my heels into the tile floor, heaved her up, and leaned her against the shower door. There was a moment where everything settled—energy, noise, movement. I placed my hand upon my mother’s shoulder and smiled. “I will not let you fall.” She nodded. My mother passed away weeks later. I drank heavily for eight months following the funeral. Sadness and grief consumed my thoughts. I will refrain from the details of my addiction but will share that I knew in my heart that it was time for an important decision to be made. I found recovery, or rather, it seemed to find me. At that time, I had no idea how my state of mind went from not caring about anything or anybody to being able to do whatever it took to be well. Yet, this is what happened. One year later, I was diagnosed with Degenerative Disc Disease in my lower back; not fatal, yet debilitating and painful. I was unable to walk, sit, drive, or sleep without discomfort. I visited a chiropractor and two orthopedic surgeons; all were unable to help alleviate the pain. I felt deep despair; the pain worsened over time. I thought about numbing the pain the only way I knew for so many years; simply, I flirted with the idea of abandoning my recently celebrated first year of sobriety. Somehow, I abstained. During this time of great discomfort, I felt an urge to run on the beach. I had no idea where this idea came from; it was intuitive and similar to the thought which prompted me to ask my mother to dance at my sister’s wedding. Go to the beach and run was what this thought said. So I went to the beach. I ran along the shoreline, without a clue as to why I was there. Severe pain emanated from my lower back—not unexpected during those days. I trudged regardless. In the distance was a pier; I decided I would try to reach the pier before giving up. I continued; the pain worsened. I was soon convinced that I had nothing left to give. I hated this situation. Why am I here on the beach?! I asked myself. I wanted to escape. I wanted to go home. I grew despondent. I slowed my pace; stopping was the thought in my head. I then heard a familiar voice deep within my soul. It was clear, encouraging, and from beyond this world. I was overwhelmed with emotion and my pace began to quicken. My legs now strengthened beneath me; my breath became deliberate. I wiped tears from my face and pumped my arms harder. And then, I was graced with what can only be described as a spiritual awakening: I realized in that moment, running on the beach, that it was my mother’s spirit that guided me toward recovery and a new life. I continued along the shoreline; I realized that failure would never be an option again, nor would pain or fear ever dissuade me from present or future goals. I learned about faith that day on the beach. I learned that those we love never leave us; rather they find more powerful ways to be with us. I learned that time and space cannot compare with the force of love. And I learned that relationships are lifelong commitments and mothers are always mothers and cannot relieve themselves of their duties any more than children can relieve themselves of theirs. I sprinted toward the pier. The pain in my back dissipated as my mother’s energy supported my efforts. When I stopped running, I paused to catch my breath. With deep gratitude, I faced the ocean and looked into the horizon. The sea was calm that day. The sun was soon to set. I took a deliberate breath. I raised my arms toward the heavens. I opened my palms, fingers outstretched. I allowed my head and neck to relax and I looked into the sky. A smile spread wide across my face. I thanked my mother for not letting me fall. Brian Hyman is the creator of 12-Step Yoga and a yoga ambassador for Manduka, YogaEarth, and YogaStart. He has been interviewed for his work in recovery by Life By Me, YogaEarth, YogaStart, and Origin magazine. Brian teaches yoga and meditation and is editing a book he wrote about wellness, spirituality, and yoga. For more information, visit www.brianhymanyoga.com.